You can’t install WordPress directly on to your computer. You need to install a web server first. This tutorial teaches you how to Install WordPress on a Windows Computer Using Bitnami local host web server. If you have problems downloading files when using Bitnami. Watch this. The WordPress Reset plugin BEWARE! There are many free ready made solutions that help you Install WordPress on a Windows Computer and get WordPress set up on your laptop or PC in just a few minutes. Bitnami is the easiest way I’ve found to Install WordPress on a Windows Computer. But you could also try Desktop Server. If you’re a computer wiz kid you might prefer XAMPP, XAMPP is more flexible but more complicated. Installing Bitnami is really quite simple. The only problems you’re likely to have are caused by your security program or Windows permissions issues. All you have to do is download Bitnami, start the install process and accept the default options. The Bitnami website tells you to just click Yes, Yes, Yes. Windows might ask for the administrator password as part of the install process. Just type it in when needed. Once Bitnami is installed click the Windows Start button and choose the Bitnami option. To log in and start editing your site. Choose Bitnami WordPress Stack Manger tool. Type in the Windows Administrator’s password if required. Click the Go to Application button. Click the Start Servers button. Click the link that says Access WordPress. In the URL bar. Type localhost/wordpress/wp-admin. and press the Enter key. Type the user name and password you set when installing Bitnami. You are now logged into Bitnami WordPress inside your laptop or PC. Of course your Bitnami WordPress site is only inside your own computer which makes it ideal for practicing and learning on. Your Bitnami WordPress site will not be accessible via the internet. This is a great way to learn WordPress and hone your site building skills without the hassle of a real live website. When you’ve finished, don’t forget to log out of WordPress and close your Bitnami server. Do you have problems downloading files using your web browser? If you run Bitnami when you are not logged in as the Windows Administrator. You may encounter a strange problem. You can download things. But then you do not have permission to access the file you have just downloaded. This is because Bitnami DOES have Administrator privileges. But your user account does NOT. When you are using Bitnami, if you download a file using your web browser. The file will be downloaded into the downloads folder belonging to the Windows administrator. It will not be downloaded into the current users downloads folder. Log out of Bitnami WordPress. 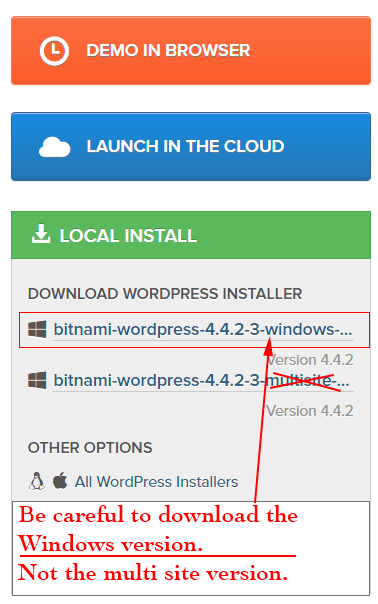 This issue only occurs when you are using Bitnami WordPress AND you download a file using your web browser. So remember. Close Bitnami before you download any files. 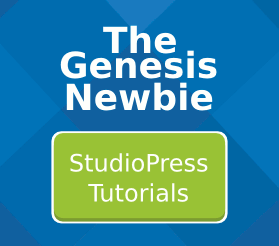 The purpose of this tutorial is to enable you to test and practice on several different StudioPress themes. When you’ve installed, tested and learned about one theme you’ll want to start afresh by installing a different theme. The WordPress Reset plugin is ideal for this. BEWARE! This plugin DELETES all pages, posts, widget settings etc. So check twice before you use it. With just a few clicks you can reset WordPress to it’s just installed state. Everything will be clean and tidy ready for you to install, learn about and practice on the next theme.